Cinco de Mayo is coming soon. This is such an awesome excuse to eat Mexican food, which is one of my favorites. Enchiladas and burritos and tacos can get boring, though. (I must say, however, not SO boring that my husband and I didn’t just practically fight to the death over the last taco from the 18-pack I whipped up the other day). If you are looking for a sort of American-Latin fusion dish to celebrate Cinco de Mayo, this is the perfect one. Take your favorite hotdogs and top them with the perfect arrangement of classic Mexican toppings and enjoy this holiday! 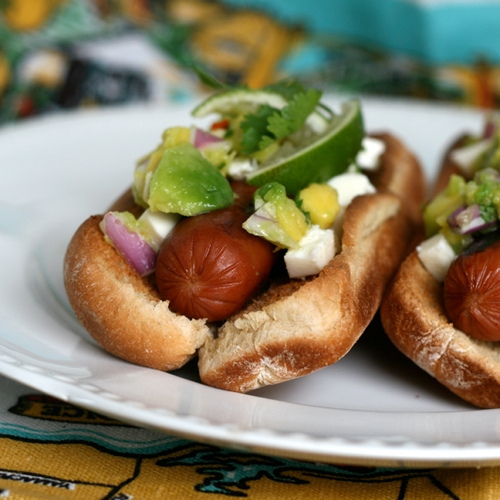 Top cooked hot dogs with avocado topping and enjoy! This entry was posted in Brady Evans Venables, Cooking, Food, Holidays, Recipes and tagged Brady Evans Venables, Columbia, columbia sc, cooking, every woman blog, Famously Hot, food, hospital blog, Lexington, lexington medical center., lexington sc, Lexington Women, lmc, LMC every woman blogger, Midlands, Midlands Women, South Carolina, South Carolina Women, Women, women's blog, women's hospital blog by Kate Gillmer. Bookmark the permalink.